This is another stitch mentioned in Found Poetry as a stitch with a poetic name. Certainly there is a sense of mystery about the name. Where are the pillars? Who is caught in the web? The stitch itself has never really "spoken" to me. Here it is from Daniela Forconi's site. But in rethinking it especially with this sense of mystery, I can see some possibilities. 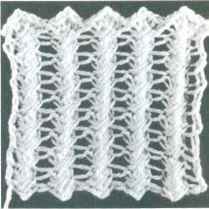 Maybe for some simple lace faggotting on under garments or frills on shells. Here is my photo take. It's not that lacey. Well, maybe the branches are, but they are rigid as is the fence (web). 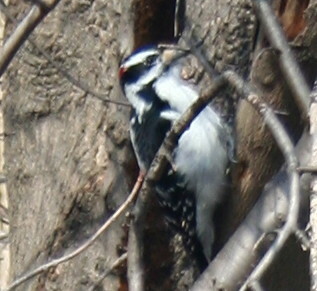 I was trying to catch in the photo a woodpecker - hope that you can see him - on a rather cold day in February. Maybe the stitch would also work for a cowl in chunky yarn for those cold winter days, then the pillars, like the trees, would be strong, yet graceful and the web would keep the warmth in and the cold out, as a fence would protect an area. Now what about the birds? Would you add a feather or two to your design to give it a little mystery, like a Dream Catcher. Now I could go on about catching the mystery of dreams in lace, with maybe a lovely hand painted yarn - suddenly a rather plain stitch has become amazing. In case you missed the bird here he is. Photos of Stitches this time.